If you’re in a hurry, check out our top pick, Sekonic LiteMaster Pro, a lux meter of choice used by professionals. If you’re interested in filmmaking, you’re definitely going to want to invest in a light meter. This essential tool is vital for testing the dynamic range of your camera and it gives you the benefit of being able to play around with contrast ratios. It seems that over the years, the value of a light meter has been swept under the rug. Instead of turning to the help of this traditional tool, people are turning to software on a computer screen to manipulate waveforms. But when it comes to eliminating exposure issues, you can’t go wrong with a light meter. Even better is that it can save you time when dealing with exposure problems. You need a handheld meter in your camera backpack. Unlike a built-in meter, a handheld one doesn’t receive any deception by extreme contrast or side lighting. A handheld meter is also well known for not taking any transillumination into account when providing you with a reading. When it comes to precision and versatility, a handheld meter is the best choice. Some light meters can be difficult to get a reading. This is why you should shop for one that comes with easy-to-press buttons and easy-to-read displays. You’ll want to be able to match the settings on the meter to the settings on your base camera and then input your shutter speed along with your ISO. From here, the light meter will provide you with valuable information relating to what you should set your aperture to so that you can get a proper exposure. It is also pertinent to shop for a light meter that has the capability to provide readings from a 1-degree angle. In being able to do this, you gain precise control over the exposure regardless of the subject as well as regardless of the distance you are shooting the subject. Even if you are sitting in the back of a theater, a handheld light meter with the capability of providing readings from a 1-degree angle will give you with the ability to take readings of the light on the subject’s clothing with no impact being made by any dark background. Lastly, when shopping for a light meter, it is important to choose one that can show you how much flash is being used in an exposure instead of just the amount of continuous light. Knowing how much flash is being used is paramount when taking photos or video of interiors. Take for example you are shooting a room’s interior that has tungsten light illumination and your meter gives you a reading of 65%; this means 35% of the exposure is being directly derived from the tungsten lighting. You will find this helpful feature on multiple Sekonic meters. Not everyone has time to spend countless hours shopping for a light meter, and it’s because of this that we have put together a helpful go-to guide for picking between some of the best light meters available on the market. Let’s take a quick look at this guide as well as our Editor’s Pick. The handheld light meter below has earned itself a spot as our Editor’s Pick because of its ease of use. Not only does it feature a helpful PocketWizard System but it also comes with a 3-year warranty. The display includes buttons that are very easy to touch, which makes it incredibly simple to adjust settings and take readings. In addition to the light meter, you get a case to store it in while you’re not using it, which adds to its protection and lifespan. 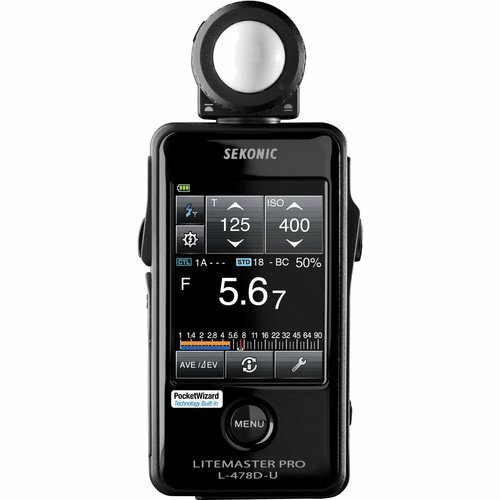 The Sekonic LiteMaster Pro L-478DR-U Light Meter for PocketWizard System With Exclusive USA Radio Frequency And Exclusive 3-Year Warranty + Sekonic Deluxe Case for L-478-series meters has easy-to-touch icons that make it simple to take readings. Thanks to the meter’s large LCD screen, you can easily read the readings. This meter comes with a 3-year warranty and a carrying case. The compact size of the meter makes it simple to pack it with your other shooting gear. Its wireless advancements give you easy control of flash power and light measurement. 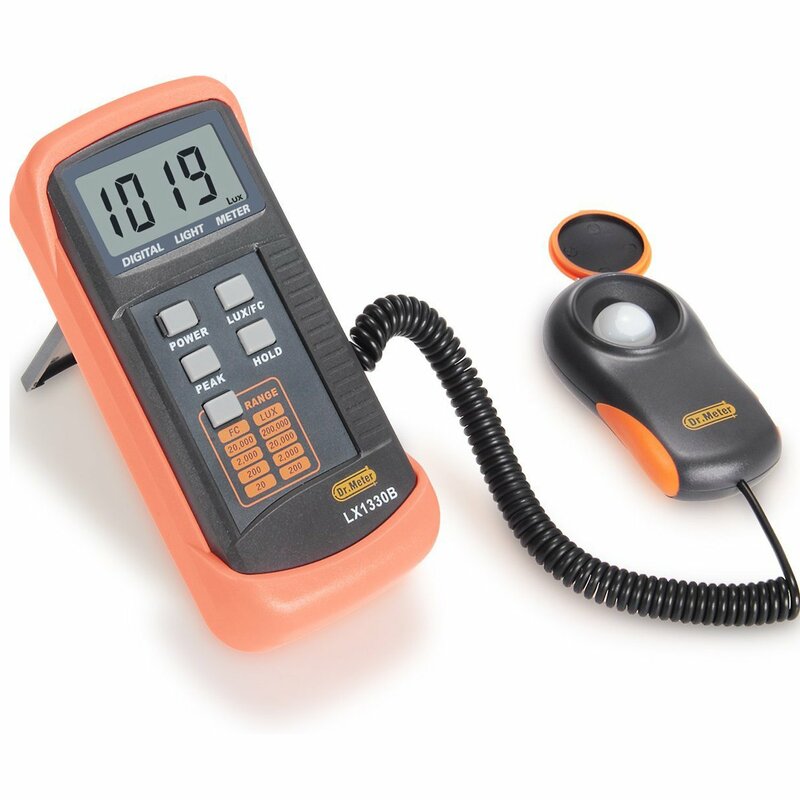 When it comes to saving money on a light meter, you can’t go wrong with the Dr.Meter LX1330B Digital Illuminance/Light Meter, 0 – 200,000 Lux Luxmeter. The meter has four ranges to choose from –0/200/2,000/20,000/200,000 Lux–. And because of its high-accuracy response, you can easily and quickly measure the lighting of your scene. You’ll also enjoy a 1-year warranty with the Dr. Meter LX1330B Light Meter. People using this light meter even claim it is can be used for much more than filmmaking or photo shoots. Take for example John who used it for growing lettuce. By measuring the lighting, he was able to mitigate tip burn while gardening lettuce. Doctor C claims the light meter is a must-have for electricians since electrical codes mandate that buildings have certain amounts of illumination in certain areas. The REED Instruments SD-1128 SD Series Light Meter, Datalogger, 100,000 Lux/10,000 Foot Candles (Fc), w/Temperature features a real-time data logger. This makes it simple to store your prior readings. It also includes a sensor cover. In regard to its user-selectable sampling rates, you’ll enjoy them from 1 to 3,600 seconds. And thanks to the light meter’s SD card feature, you can select a sampling rate and use it to generate an Excel file with your readings with no need to use any special software. If you’re needing to use the light meter for long-term monitoring, you can always pair it with the optional tripod and an AC adapter. 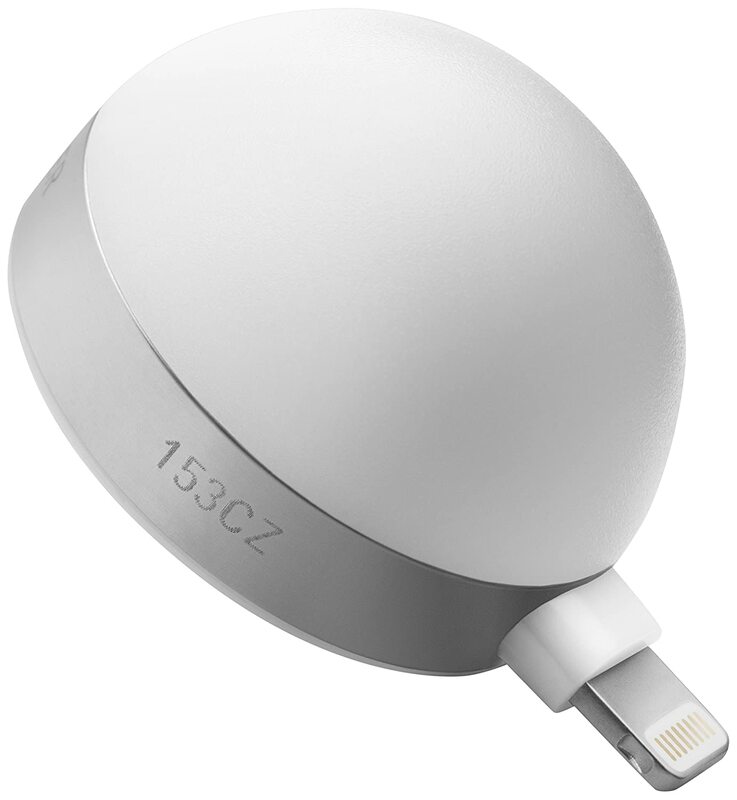 You’re going to love the modern design of the Lumu Power Light & Color Meter for Photo and Video. Even better is that this tool turns your current iOS device into a light meter. You can do everything from measuring flash exposure to color temperature and much more. To use your current iOS as a light meter with this tool, you’ll need to download the app to your iOS device, connect the Lumu Power Light & Color Meter for Photo and Video, and you’re ready to go. With the Lumu Power Light & Color Meter for Photo and Video’s ambient exposure feature, you can rest easy knowing you’re going to get a perfect exposure each and every time. With the flash exposure feature, there’s no more guessing about which settings to use. When using the color control feature, your whites are going to white while your colors are going to be vibrant in each and every shot. 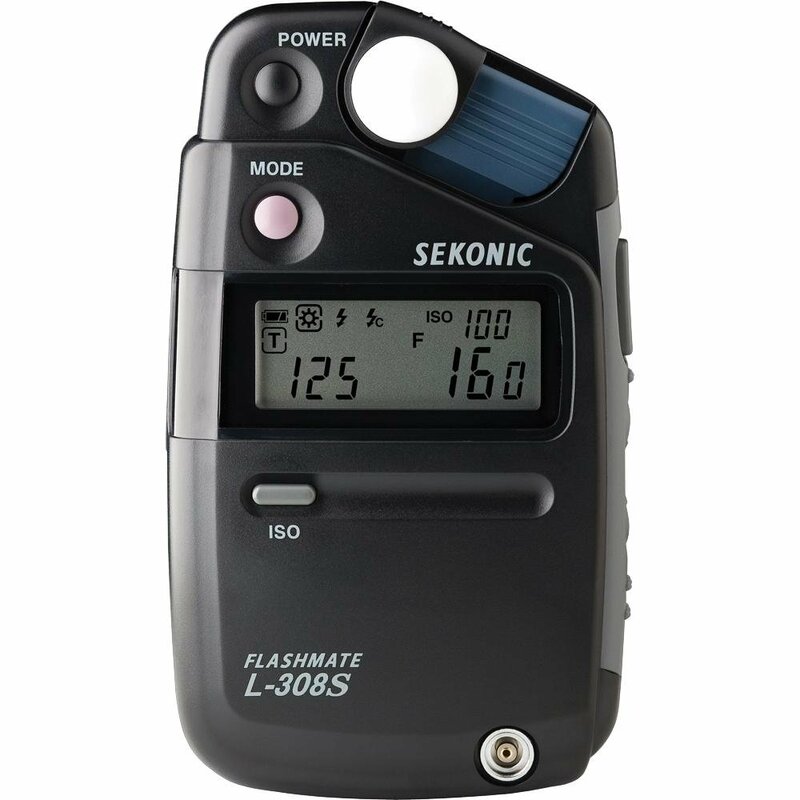 The Sekonic L-308S Flashmate Digital Incident, Reflected & Flash Light Meter is perfect for beginners. When you put the meter into a flash metering mode, you gain the advantage of having a full 90 seconds to manually measure the flash. This meter is especially helpful to those looking to take the guesswork out of choosing which aperture to use. When it comes to portability, you can’t go wrong with this light meter. 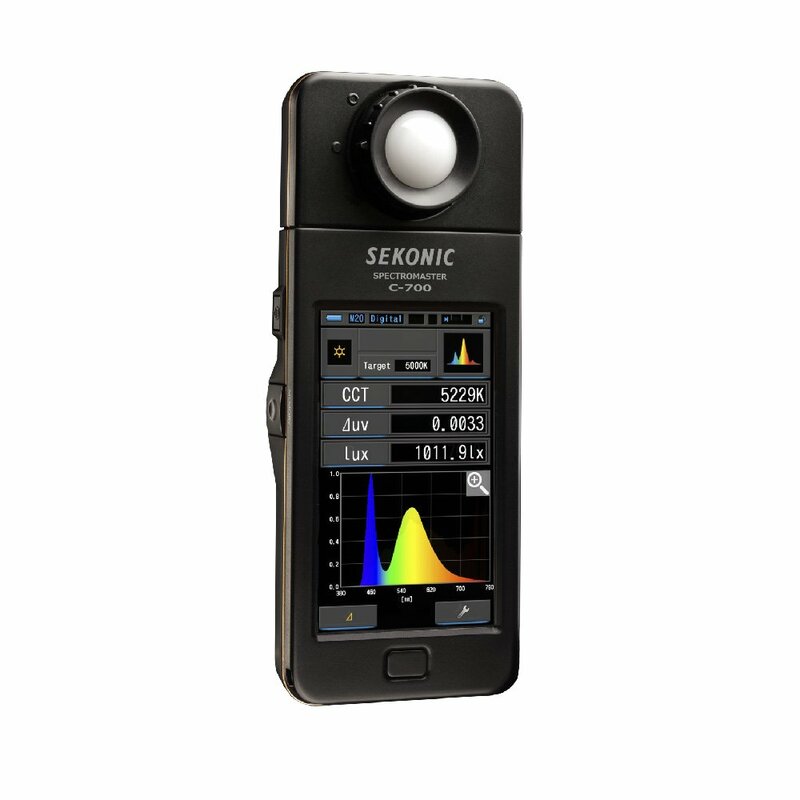 Out of all Sekonic light meters, it is the smallest and lightest. For its small size, though, it sure does boast a variety of features. Take for example the meter’s ability to read ambient and flash exposures in both incident and reflected modes. The Sekonic L-398A Light Meter Studio Deluxe III (401-399) is an ideal light meter for those who are doing still photography. It is also favored by those in cinematography too. The ISO range on the meter is 6 to 12,000, with 1/3 step increments and thanks to the amorphous photocell, there is no need to worry about using and charging a battery or having to use an external power source. When using this light meter for reflected readings, the Lumisphere can easily be replaced by the flat Lumigrid. If you intend to shoot using a fixed ISO, you can take advantage of the optional Slide Set; this enhances the readings given when shooting fast-paced scenes. The Shepherd Polaris Karat Flash Meter features a multi-flash as well as a backlight digital LCD display, making it simple to read the readings both during the day and night. This full-featured meter also holds the spot of being the first handheld light meter that has the ability to measure flash duration. Thanks to the flash duration measurement mode, you can easily do readings for stop-action and fast-paced scenes. Even better is the light meter provides reflected, incident, and ambient readings, making it one of the most versatile light meters on the market for its price. The Kenko KFM-2200 Cine and Flash Meter has an N CORD Mode feature, meaning it can flash without having to use a syncing cord; this is for incident light only. With the AMBI Mode, you can do ambient light. The most notable benefit of this meter is that you can use it for both flash and spot metering without having to switch back and forth between two different units. Thanks to the Exposure Navigation System on the Kenko KFM–200 Cine and Flash Meter, you can easily read information that makes it simple to determine the exact settings you should use for proper exposure. On the Sekonic Speedmaster L-858D-U Light Meter, you’re going to find all kinds of valuable features, including flash duration measurements. You’ll also enjoy features like HSS flash measurements and a flash analyzing function. If you’re wanting to shoot a scene where you freeze a fast-moving subject, the flash duration measurement mode makes this possible. With the light meter’s enhanced ISO capabilities, you can measure light in very dim settings. The meter even features an additional three stops of light sensitivity, perfect when doing incident lighting. The flash analyzing function is ideal for on-location shooting and can be used to lighten shadows as well as to reduce background detail. If you’re looking for a light meter with a rotating head, the Sekonic L-758D DigitalMaster Light Meter is the perfect fit. Its head can rotate a full 90 degrees to the right and has the capability to move a full 180 degrees to the left. Even better is you can remove the head if you’re wanting to take a contrast reading. With the light receiving method feature, you can do readings for both incident and reflect lighting. This meter also features a receptor incident light that can be converted into a flat diffuser. All you have to do is put the Lumisphere into a down position. The reflected metering distance on the meter is 1.0m to infinity. And did you know this is the only meter that can be calibrated to read light specifically for the way your camera system reads light? You can even use the light meter to profile data for up to three cameras. You can then sync the data with your computer to generate reports that detail the ideal settings for each of the three cameras you are profiling. With the Ikan CV600 Digital LED Light Meter with Exposure, Spectrometer & CRI for Photography, Black, you can use the color correction filters calculator to pinpoint and match colors regardless of the light source. And thanks to the CV600 ranges of between 380nm-780nm, the spectral wavelength can be used to determine where Delta Ascension is taking place. This light meter is definitely for professionals who have a strong understanding of various measurements. Take for example its flicker measuring modification feature that allows a user to see if light being measured is outside the safe PASS zone or in the camera’s Frames per Second. When using the light meter in exposure mode, you can adjust for time of exposure or F-stop. When in TF mode, you can adjust for both the time and F-stop. 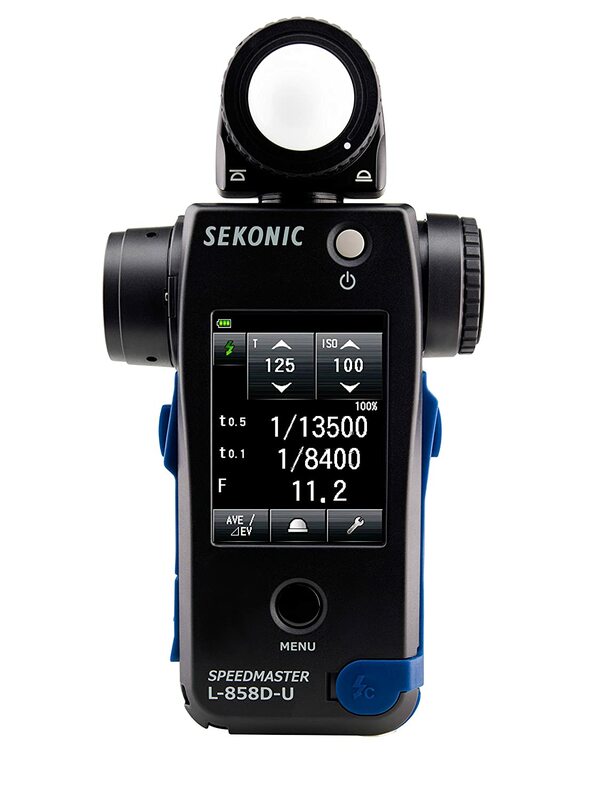 The Sekonic C-700-U Spectromaster Color Meter is another meter that is designed for professionals. If you’re just entering into the world of photography and cinematography, you’re going to have a difficult time understanding all the settings on this light meter. Some of the most notable features on the light meter include its ability to measure flash illumination with a wireless pocket receiver that you simply trigger when you’re ready to take a reading. You’re going to notice this light meter rivals all other meters in regards to color measurement accuracy. It even has the ability to capture spikes in light source output; this is especially advantageous when shooting in fluorescent and LED lighting. Thanks to the CMOS linear image sensor, the light meter can measure any light source. Its touch-screen display makes it easy to navigate through the various features and modes, including lighting comparisons and spectral distribution. This meter even has a spectrum screen that showcases spectral energy distribution of its source in real-time. You can view this data in the form of a graph. And with the CRI index, you can use general CRI along with rendering index average and special CRI to determine how well different colors will be reproduced with various lighting and aperture settings. As you can see, the lower priced light meters are more ideal for beginners, while the higher-priced ones are going to be better suited for professionals and those who have extensive experience in photography and cinematography. All of the light meters above have received great reviews from numerous users and we have found they are a great investment. We hope after reading through our guide that you will find it much easier to purchase a light meter that can meet all of your light measuring needs.